Marine biologist Paul Spong descibes the life and habits of the orca. A short background piece by orca expert Eric Hoyt on how and where orcas like Keiko are captured, where they go, and the effect of capture on those animals left in the pod. 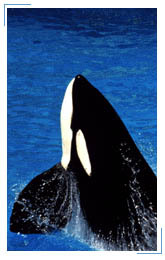 Orcas are highly social animals, who communicate in dialects specific to their pod or clan. Read more about orca communication.